Payment « Global Market Insights, Inc. The exponentially expanding e-commerce sector has indeed brought a disruption in the operation fashion of traditional brick and mortar stores. Mobile POS terminals market, a major beneficiary of this change, is gaining a substantial traction in this transformative merchandizing landscape. The increasing penetration of EMV contactless payments in digitized financial transaction is undeniably boosting global mobile POS terminals industry share. 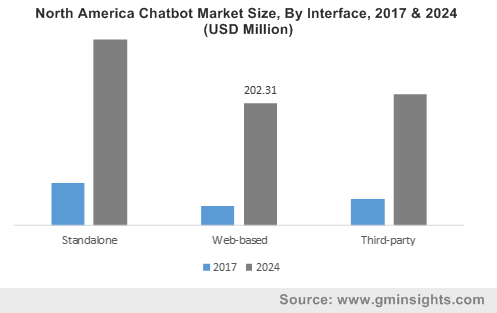 Payment service providers are scrupulously planning to bring forth an array of products that not only boost their day to day sales but also improve the consumer experience. Concurrently, many central banks, payment networks and other governmental bodies across the globe are also implementing mobile POS systems by virtue of its extensive benefits like ease of installation, less settlement time, and scalability of solution. Reportedly, the number of users in mobile POS payments would be more than 970 million by 2022. 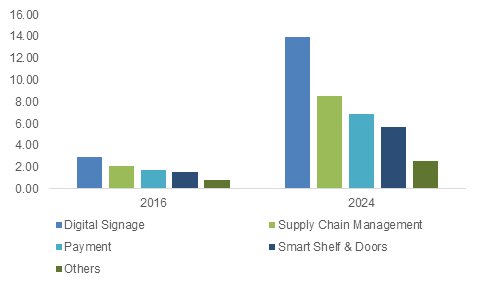 The commercialization potential of the entire business space is further coherent from the estimates brought forth by Global Market Insights, Inc. forecasting the worldwide mobile POS terminals market to exceed a valuation of USD 55 billion by 2024. While the growing inclination toward real-time payment modes create new challenges, joint venture and collaborative approaches can allow industry players to pool competencies. In fact, the trend has already established its presence in the competitive arena of the business space. For instance, recently renowned payment solution provider, Network International, augmented identity specialist IDEMIA, and tech giant Mastercard have teamed up to introduce a mobile POS terminals project in UAE. Reportedly, this collaborative project would allow UAE based Network International merchants to avail contactless payments via NFC (near-field communication) enabled smartphones. Network International is claimed to be the largest merchant acquirer in Middle East belt and the conjoint initiative, as per experts’ opinion, undoubtedly marks a significant step toward enhancing the region’s payment infrastructure. The initiative is rightly touted as the first of its kind in UAE mobile point of sale terminals market. Technology has always been a key enabler of advancements across the finance-oriented industry verticals. Mobile POS terminals market is probably one of the largest recipients of the transformed payment landscape. The pay-tech revolution is allowing modern digital payment modes to address payment efficiency, speed, risk detection as well as user experience, providing SMEs the access to tailor their operations in sync with the latest advancements. In this regard, cloud based mobile POS terminals industry is gaining a mass popularity across the globe primarily on account of its enlarged storage facility, ease of operation, and better functionality. Incidentally, this has encouraged a host of new vendors to include SaaS-based solutions in their offerings like Toast, Square, Springboard Retail, and Touchbistro. Say for instance, NewNet Communication Technologies and its partner Neubits have recently made it to the headlines with the successful trial of STC (Secure Transaction Cloud) on AWS (Amazon Web Services) in Singapore. The trial has already set a major benchmark in mobile POS terminals industry after successfully testing transactions for mobile payments via smart POI devices, mPOS terminals, and web payment clients. Reported to be available on AWS marketplace, NewNet’s STC allegedly supports usages in private, public, or hybrid cloud infrastructure with advanced level point-to-point encryption, and data security. Inherently stimulated by such highly developed web-based payment models, cloud based mPOS terminals industry is slated to grow at a CAGR of 20% over 2018-2024. While the growth rate is quite impressive, security concern is the single most factor holding back smartphone payment adoption across some of the geographies, leaving a perpetual impact on the mPOS terminals market share. Armed with an intent to overcome the challenge, many retailers are now implementing combo terminals that are capable of reading both EMV and NFC transactions. 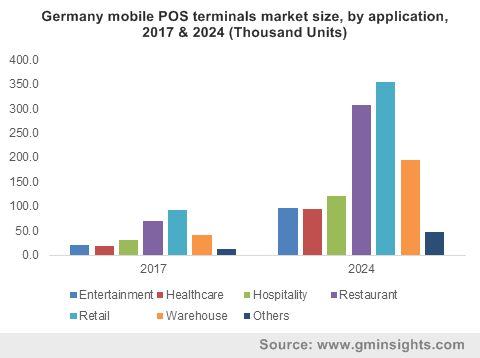 All in all, with the remarkable proliferation in mobile technology and the growing consumer awareness toward contactless payments, mobile point of sale terminals industry is likely to be one of the most challenging yet remunerative business spaces to watch unfold. This entry was posted in Electronics and Media and tagged Display, Global Mobile POS Terminals Market, Hardware, Mobile Payment, Mobile Point of Sale Terminals Market, Mobile POS Terminals Market Analysis, Mobile Technology, mPOS Market Size, mPOS Terminals Market Share, mPOS Terminals Market Size, Payment, point of sale, Retail, Sales Point, Software, System.